Currently costs 150 points and 1 skillpoint to be able to purchase, explosive ammunition not provided. 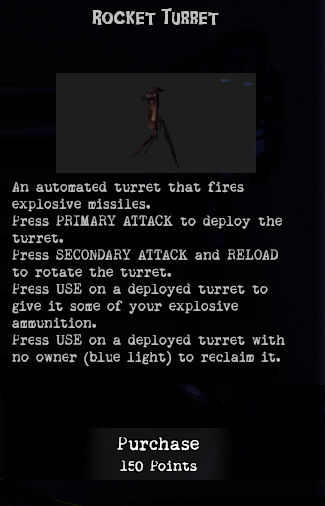 Reduce Points Shop price cost or introduce a new crafting recipe using the Gun Turret. @asdasdasd Considering that ALL deployables use the same button, it’s the player’s fault if they don’t know that. Not really for either, from my experience it can be strong since it scales based on zombie count quite hard. I may make it 125.